The PopUp.Next is designed by Italdesign, and collaborated on by a joint partnership between Airbus and Audi - with Audi designing the base car system and Airbus designing the powered lift portion of the aircraft. 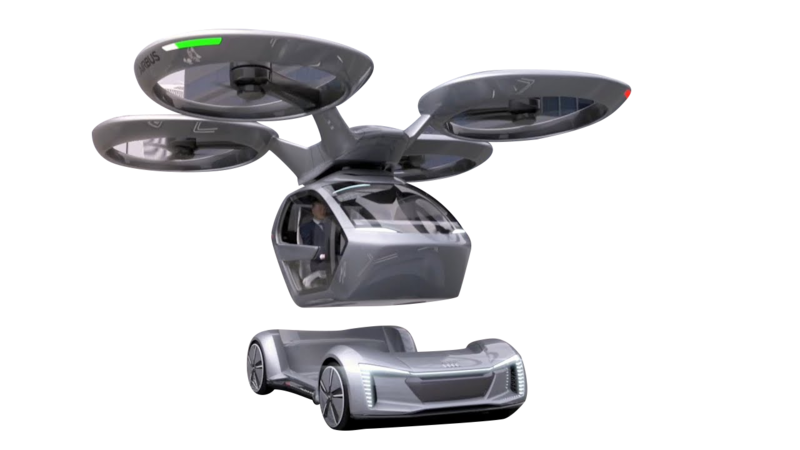 Pop.Up combines the flexibility of a small two seater ground vehicle with the freedom and speed of a vertical take-off and landing (VTOL) air vehicle, thus bridging the automotive and aerospace domains. The core of the product is therefore the Intermodalityand making it modular. Under this motto, which is partly included in the name of the new concept and is also the standard bearer for Italdesign’s first 50th anniversary celebrations, the team is working on the future medium/long-term development of the Pop.Up Next project. Audi’s four rings bestow an element of prestige on future mobility, witnessed by Pop.Up Next, whilst maintaining its own democratic approach through shared usage extended to all those living in the megacities involved. Airbus is strongly commited to the future development of Urban Air Mobility, and believes that it can only be achieved by collaboration among various transportation sectors. Italdesign will drive this project further in the future, thus confirming more and more its new function as a hub and an incubator for ideas and innovative services for mobility. The Pop.Up Next has a large amount of momentum - and was recently authorized to be test in Ingolstadt, Germany (read TransportUP's coverage of the approval here). However, a large amount of coordination between companies must occur if a prototype is to be delivered on schedule, on budget, safely. The resource pool is strong with this partnership, but the coordination requirements are amplified as well.